The wine highlight of every spring – and arguably of every year – is traveling to Paso Robles for Hospice du Rhône and the accompanying get-togethers. I'd helped pour for Harrington Wine at the Pinnacles Wine Festival on the Saturday before HdR again this year, and following the event I drove to Paso Robles for the night. Al Osterheld, who was on his way to pre-HdR winery visits over the next few days, joined me the next morning for a couple of tasting room stops before I headed back to Oakland that afternoon. '06 Grenache, Paso Robles: light color, very bright cherry / cranberry fruit with some spice overtones, juicy acidity, medium tannins, quite nice. '06 "Raucous," Paso Robles: 50% Syrah, 20% Cabernet Sauvignon, 20% Petite Sirah, 10% Grenache. Medium color, black cherry and darker fruits, herbs, touch of vanilla/oak, moderate tannins. '05 Syrah, Paso Robles: medium-dark color, plum / blackberry flavors with grilled meat and spice notes, medium tannins. '04 Syrah, Paso Robles: bigger and riper than the '05, more lush mouthfeel, and a bit more noticeable oak. '05 Petite Sirah, Paso Robles: dark color, earthy, leathery aromas with some funky notes, dark fruits and fairly tannic. '06 Petite Sirah, Paso Robles: dark color, brighter blueberry / blackberry fruit with a touch of black pepper, and bigger, chewier tannins than the '05. Al and I got together for coffee on Sunday morning, and looked through the Paso Robles Wine Country Alliance wine touring brochure for a winery that sounded interesting and opened before 11am. We decided to visit a place that was new to both of us, Venteux. Located on Las Tablas Road in Templeton, a few miles west of Highway 101, Venteux is one of Paso Robles' newer wineries, with their first vintage in 2003. Owners Scott & Bobbi Stelzle moved from Arizona in 2000 after falling in love with the Paso area and its wine during a Central Coast vacation. Before starting their winery (and adjacent bed & breakfast), Scott was in the construction business and Bobbi was an interior designer. They've been building their own wine facility, and their first crush on the property was in 2006. They opened a tasting room last year – for now it's located at the lower level of their B&B (barrel storage is currently under the B&B as well), but it will all be moved the short distance to their new winery building soon. Walking in to the barrel room, we were greeted by the lovely Cindy, who told us a little more about the winery. Venteux has been sourcing most of their fruit from Starr Ranch, on west side of Paso Robles, as they wait for their own 7-acre vineyard to mature. They've planted Syrah, Grenache, Mourvèdre, and Petite Sirah on the property. 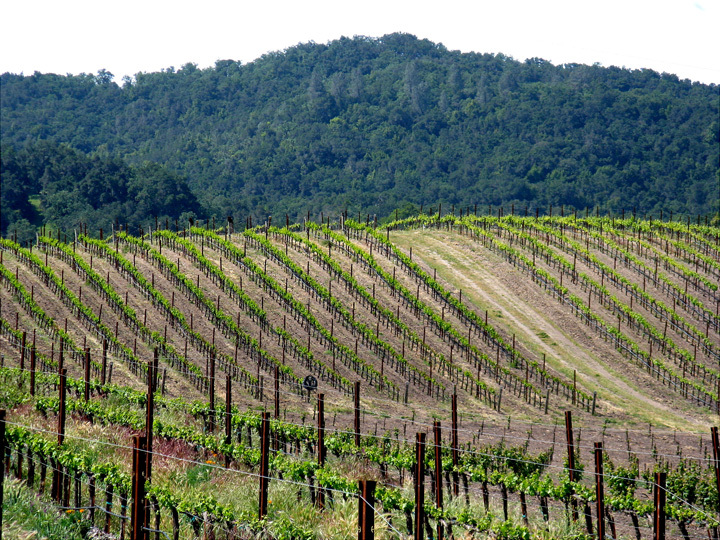 The vineyard soil includes some limestone and shale, and they plan for it all to be dry-farmed. The first fruit from their vineyard was used for a couple of small-production 2005 estate bottlings, and they'll be using more of the fruit in ensuing vintages. Scott makes the wine, having learned from several local vintners. Production is still quite small – only 900 cases in '06, increasing to about 1,600 cases in '07. Venteux has their own small bottling line that they share with some other small wineries, something that Cindy noted is helpful for handling small bottling runs. 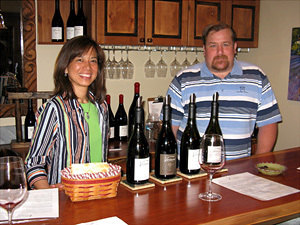 Cindy led us to the tasting bar, where she poured us the most recent Venteux releases, assisted by her colleague Joel. Considering neither Al nor I had heard of the winery before and had no expectations going in, we were pleasantly surprised by the wines. While they're not at the knock-your-socks-off level, they're tasty and well-made. There are a lot of new Paso wineries, and we'll have to see in the years to come whether Venteux sets itself apart from the crowd, but it's off to a good start. '06 Viognier, Paso Robles: light color, citrus aromas with floral notes, fairly rich mouthfeel, nice acidity with clean, crisp finish. '07 Viognier, Paso Robles: ripe stone fruit aromas, richer mouthfeel than the '06, with distinct leesy notes and a hint of vanilla/oak, good acidity with a smooth finish. '06 "Blanc du Rhône," Paso Robles: 46% Marsanne, 27% Viognier, 15% Roussanne, 12% Grenache Blanc. Light color, citrus and stone fruit aromas with spice notes and touch of minerality, oily, viscous mouthfeel, smooth finish. '06 Grenache Rosé, Paso Robles: very light salmon/peach color, strawberry and cranberry aromas with a hint of spice, crisp finish. '04 Grenache, Paso Robles: medium-light color, cherry / cranberry with herbal notes, juicy acidity, medium tannins. '05 Grenache, Paso Robles: medium-light color, darker fruit character than '04, touch of vanilla/oak, richer mouthfeel and bigger tannins. Robles:55% Mourvèdre, 22% Syrah, 12% Zinfandel, 11% Grenache. Medium color, bright, brambly Zin-like fruit (surprising with only 12% Zin), with overtones of spice and black pepper, mouthfilling and not very tannic, just a hint of heat on the finish. '05 "Vertigo," Paso Robles: 70% Grenache, 17% Mourvèdre, 13% Syrah. Ripe black cherry and blackberry aromas with earth and vanilla/oak, flavors add some black pepper and spice to the mix, great structure and fairly tannic finish, very tasty! '05 "Le Thief," Paso Robles: 59% Syrah, 23% Grenache, 13% Mourvèdre, 5% Cinsault. Similar fruit profile to the "Vertigo" but softer style, more plush mouthfeel, some smoky notes, smoother tannins. '05 "Cuvée des Cinq," Paso Robles: 29% Mourvèdre, 26% Grenache, 26% Syrah, 10% Counoise, 9% Cinsault. Smoky vanilla/oak aromas along with boysenberry / blueberry fruit, some earth and spice, rich and mouthfilling, moderate tannins. '05 "Syrah Sélectionée," Paso Robles: medium-dark color, ripe plum and blueberry with lots of vanilla/oak aromas, smoke and spice notes, smooth mouthfeel with medium tannins and long finish. '05 Syrah, Starr Ranch, Paso Robles: smoky, tarry blackberry fruit, some earth/funk notes and an interesting mineral character, very complex and quite tannic. 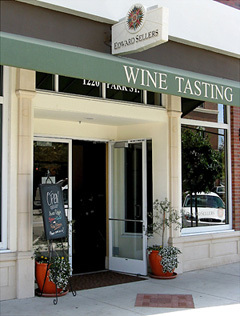 I'd stopped to taste at Edward Sellers in early December of last year, and I was impressed by the wines. 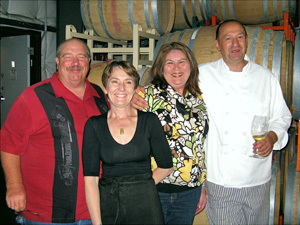 I arranged another visit, this time meeting there with winemaker Amy Butler. Al and I drove to the winery's downtown Paso Robles tasting room, where Amy greeted us. As she poured us Edward Sellers' current releases, she talked with us about her winemaking background and about each of the wines. 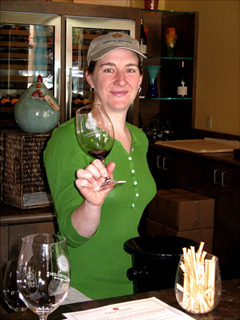 Amy attended UC Davis before working with Ed Kurtzman at Chalone Vineyard. She worked at a couple of other places, including at Schramsberg for four years, before hearing about the winemaking position at Edward Sellers' brand-new winery in 2004. She's been on board as winemaker since their first vintage that year. The '04 wines were made at the old Paso Robles Wine Services facility, but since then they've been produced at Denner Vineyards. Amy mentioned she's been very pleased with the Denner facility. Edward Sellers is planning to build their own winery, and expect to break ground on it this summer. 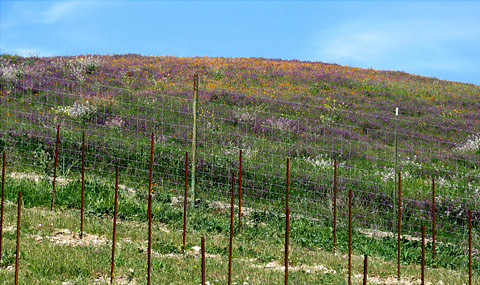 They've also planted their own vineyard, on the south side of Highway 46 a couple of miles west of 101. About 15 acres of the new vineyard should come into production this year out of about 20 acres planted. Regarding the wines themselves, the Viognier is sourced from Fralich Vineyard. The fruit is picked earlier than other Viognier sourced from Fralich, then fermented in both neutral oak and steel barrels, where the lees is stirred. We got a preview of the '07 to compare with the current '06 – the '07 differs in that it adds a little bit of new oak into the mix. There's about 12% new oak in the "Blanc du Rhône" white blend, though it doesn't stand out. The Rosé is fermented in neutral oak, with small amount of Syrah blended in for color – we were surprised to learn that since the color is very light for a Rosé. 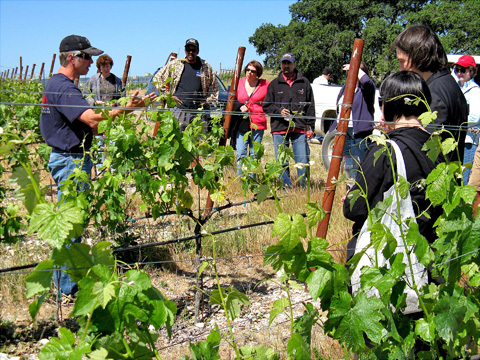 The Grenache comes from Halter Ranch, Hearthstone, and Vista Creek vineyards, and has about 3-5% Syrah blended in. In 2004, there was fruit from some virused Zinfandel vines on the Edward Sellers property that they wanted to use before pulling the vines out, and it went into '04 "Cognito" blend, which is about 22% Zin. Being a Rhône specialist, they had not intended to make a wine with any Zinfandel again, but the "Cognito" was so popular that they continued with a similar blend for '05 – it's the most fruit-forward of the line-up. Of the red Rhône-style blends, the "Vertigo" has about 20-30% new oak, 45% for "Le Thief," and around 70% for "Cuvée des Cinq" and "Syrah Sélectionée." The "Syrah Sélectionée" is 100% Syrah, and is sourced from six vineyards, mostly on the west side of Paso, and mostly from the Estrella Syrah clone. The Starr Ranch Syrah uses the 383 and 2A Alban Syrah clones. Edward Sellers' wines are big, with most reds over 15% alcohol, but they're very well-balanced…..not over-ripe and no sign of heat on most of them. They're not huge in the style of some Paso reds, but they're not shy wines by any means. And unlike some wineries that produce a number of red blends, all of Edward Sellers' blends were distinctly different from one another – that's not an easy goal to achieve, and Amy deserves a lot of credit for this. This looks like a winery to watch in the years to come, especially as the vineyard matures and the new winery is completed. After finishing our tasting at Edward Sellers, I drove back to the Bay Area to take care of some winery-related work over the next couple of days. I returned to Paso Robles on Wednesday afternoon to start in on the pre-HdR festivities, beginning with the annual "Pinot Pirates" offline organized by Augie Hug at Villa Creek restaurant that evening. '06 "Alchemist": 85% Syrah, 15% Cabernet Sauvignon. Ripe dark fruits, medium weight with good acidity but a bit shorter finish. '06 "Vertigo": 90% Syrah, 10% Grenache. Very big wine, blackberry fruit with some tar and spice overtones, slightly hot finish. '06 "Fracture": Dark fruits, smoke, not as much apparent sweetness in the fruit as the other reds, great structure and firm tannins. '06 "Vertigo": Still in barrel, will be bottled later. Similar to the other sample, but seems a bit more primary with more grippy tannins. '07 "Vertigo": Riper aromas than the '06, sweeter and brighter fruit, with more apparent wood tannin at this point, this still has a ways to go. Brad Harrington of West Coast Wine Net and I organized a pre-Hospice du Rhône tour of a couple of vineyards on the Thursday just before the start of the event. That morning, a group of us drove out to visit with owner and winemaker Eric Jensen of Booker Vineyard, one of the hottest new Paso Robles vineyards and wineries. I'd visited with Eric back in December, and he was eager to take time out of his busy day in the vineyard by hosting our group (which was augmented at Booker by some people from the Mark Squires wine board). After a brief wait, we walked into the Booker tasting room, where Eric took us through a speed-tasting of a number of yet-to-be-released wines, a real treat. He's planning a few changes in his winemaking as he moves forward with his venture – for example, he will be using more 500-liter puncheons for aging his reds. And he’s not a fan of stainless steel for whites, so he plans to try some cement fermentation tanks for those. Eric plans to barrel-age his wines longer and hold them after bottling for a longer time before releasing them – most two years in barrel and one in bottle. The '06 Bordeaux blend we tasted will remain in barrel for another 1-2 years. He will have two bottlings of the '06 "Vertigo" – one is already out of barrel while the other will spend more time in barrel and will be bottled later. Eric is unsure at this point as to whether or how he will differentiate the two. The '07 "Vertigo" has a little more Grenache than the '06. After the tasting, most of us then headed up into Eric's steep hillside vineyards with him to get a quick look at the rocky soil and hardy vines. His 42-acre vineyard, a few miles west of Highway 101 and north of 46, is not very old, but sells fruit to some very prestigious producers from the Paso area and beyond. Eric has planted some new head-trained, own-rooted Grenache vines. He’s also experimenting with some other own-rooted plantings. 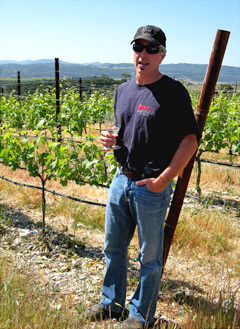 Eric wanted to dispel the often-repeated but erroneous report that Justin Smith had made the first ('05) vintage of Booker wines. Justin, along with Stephan Asseo of L'Aventure, were Eric's mentors as he learned winemaking, but Eric had gained plenty of experience by the time he launched his own label and he's made all of the Booker wines himself. All the wines are big, ripe, and fruit-forward, but they carry their relatively-high alcohol well. Impressive wines in the style of Saxum and L'Aventure, the "Fracture" was my favorite of the bunch. '02 Viognier, Larner Vineyard, Santa Ynez Valley: light gold color, stone fruit aromas with touches of honey and spice, smooth finish. '03 Viognier, Larner Vineyard, Santa Ynez Valley: slightly darker color than the '02, a bit more subdued fruit with a stronger spice character. '05 Viognier, Larner Vineyard, Santa Ynez Valley: more upfront fruit than the '03, with distinct floral notes. '06 Viognier, Larner Vineyard, Santa Ynez Valley: brighter stone fruit and lemon aromas, medium weight in the mouth, crisp acidity and long finish, terrific Viognier. '04 Rosé, Central Coast: light pink/bronze color, strawberry and raspberry fruit that seems to be starting to fade a bit. '05 Rosé, Central Coast: light salmon color, more precise fruit aromas, more spice character. '06 Rosé, Central Coast: brighter strawberry fruit in nose, floral and mineral notes and hint of spice, livelier acidity than the '05. '01 Syrah, Shadow Canyon Vineyard, York Mountain: medium-dark color, ripe blueberry and blackberry aromas with some tar, grilled meat, and herb overtones, moderate tannins. '02 Syrah, Shadow Canyon Vineyard, York Mountain: stonger herb and black pepper in the nose along with dark fruits and a touch of smoke, more tannic than the '01 but great balance, very nice. '03 Syrah, Shadow Canyon Vineyard, York Mountain: bummer, corked!! '04 Syrah, Shadow Canyon Vineyard, York Mountain: riper blackberry aroma with a floral note, black pepper, mouthfilling with firm tannins. '05 Syrah, Shadow Canyon Vineyard, York Mountain: Blackberry and black pepper, with an earthy/funky note, rich mouthfeel and medium-big tannins. '03 Grenache, Larner Vineyard, Santa Ynez Valley: medium-dark color, bright boysenberry and spice aromas, still with very grippy tannins. '04 Grenache, Larner Vineyard, Santa Ynez Valley: riper nose of raspberry and blueberry, some black pepper notes, rich, densely-packed flavors, and a touch less tannic than the '03, quite tasty. '04 "Amila," Central Coast: about 70% Shadow Canyon Syrah, 30% Larner Grenache. Brighter ripe raspberry / blackberry fruit than the '04 Syrah, along with that characteristic black pepper, and medium tannins. '05 "David Salvador," Central Coast: about 50% Shadow Canyon Syrah, 48% Larner Grenache, 2% Larner Viognier. Slight funk, dark fruits with some spice notes, not as interesting as the '04 at this stage. '02 Sine Qua Non "Just For The Love Of It": slightly corked, but still moderately intense blackberry fruit with distinct floral, spice, and black pepper notes, with a fairly soft finish. '03 "Paeonia" Late Harvest Pinot Blanc, Bien Nacido Vineyard, Santa Maria Valley: about 27% RS. 1.0g/L TA. Wow! Intense apricot and honey aromas, extremely thick, syrupy, and mouthfilling, nice balancing acidity, very long finish, outstanding dessert wine. '04 "Paeonia" Late Harvest Pinot Blanc, Bien Nacido Vineyard, Santa Maria Valley: Similar to the '03, but a bit less intense apricot and a stronger spice element, still very rich and viscous in the mouth, though a touch shorter finish than the '03. Our WCWN group left Booker and drove west along Highway 46, turning off at York Mountain Road and then heading into the mountains to the north…..I actually zoomed back into town first to pick up some box lunches we’d ordered before meeting up with the rest of the group at our destination. After a couple of miles winding along narrow paved and dirt roads, we arrived at Shadow Canyon Vineyard, located in the tiny York Mountain AVA. Shadow Canyon owner/winemaker Gary Gibson and his co-winemaker Jeremy Weintraub welcomed us to the vineyard. 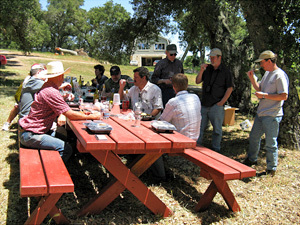 We repositioned a couple of picnic tables and unpacked the lunches as Gary and Jeremy began to bring out bottles of just about every wine Shadow Canyon has released since their initial vintage in 2001. It would have been every single wine, but Gary mistakenly brought an extra '03 Grenache instead of the '05….oh well, something for us to try next time! I’d first met Gary during a visit to the vineyard with Eric Anderson and a few other people in 2005, but this was the first time I’d met Jeremy, who joined Shadow Canyon two years ago after working at Tantara Winery. As we munched on our lunches, Eric and Jeremy began to pour their wines for us, beginning with a vertical tasting of Viognier, followed by Rosé, Syrah, Grenache, red blends, and late harvest Pinot Blanc. After the frenetic energy of Eric Jensen at Booker, Gary was almost the complete opposite – very low-key and unassuming. But like Eric and all great grapegrowers, he’s passionate and detail-oriented when it comes to his vineyard and his wines. Most of the fruit for Shadow Canyon wines is sourced from their own vineyard and from Larner Vineyard in Santa Ynez Valley’s Ballard Canyon. Shadow Canyon’s early Viogniers were all made in neutral oak, with regular lees stirring, while the recent '06 was made in about half neutral oak and half stainless steel. There was no '04 Viognier – deer got the fruit that year. Rosés are made entirely in stainless steel and are about 25% Larner Vineyard Grenache and 75% Shadow Canyon Vineyard Syrah. We tasted Gary’s very first wine, the '01 Syrah, which was still drinking beautifully. The Syrahs see about 40% new oak, mostly Taransaud barrels. Grenaches are made from the unique Larner Clone, which yields a darker and richer wine than most California Grenache.The Shadow Canyon late harvest Pinot Blancs are some of the most hedonistic and delicious dessert wines made in California. I should mention the beautiful packaging of the Shadow Canyon wines – distinctive bottles and great attention to detail. Toward the end of our tasting, Gary brought out a surprise – a bottle of Sine Qua Non "Just For The Love Of It," rated 100 points by the Wine Advocate. Gary noted that this wine contains about 6-8% Syrah from Shadow Canyon Vineyard, and Maureen Harrington from our group quipped that without that 6-8% of Gary's fruit, the wine would have only scored 92-94 points! Following our lunch and tasting, we followed Gary down the southwest-facing slope alongside his vineyard. The vineyard is higher and considerably farther west than most Paso-area vineyards – 1,600-foot elevation and only about 8 miles from the coast – and it's right in the path of ocean air pulled inland through the Templeton Gap, so the growing conditions are cooler. The soil is siliceous shale / loam, and the vineyard is very rocky. The thin vines are a testament to how hard they must struggle in the difficult soil. There are about 9½ acres planted – it had been all Syrah, but very recently a small block near the bottom of the hill was grafted over to Grenache. It was a good workout climbing back up the hill to our cars! Shadow Canyon’s wines are big and flavorful, but don't tend to be as ripe as some other Central Coast wines, and they're far from being fruit bombs. Never heavy or ponderous, they're impressive in walking the line between power and elegance, some of the best Rhône-style wines the Central Coast has to offer. Since I was helping to pour for Eno Wines on Friday, and for Broc Cellars and Eno on Saturday, I didn't have much time to get around to taste at the event. But Al Osterheld agreed to supplement my short list of favorites with a few of his own….though I'm sure we’re both forgetting a bunch of other good ones. The listed wines are ones that we had not tasted before this HdR. The Arnot Roberts Clary Ranch Syrah was the find of the event for me – a Syrah with tremendous cool-climate character that’s not often found in California. '06 Côtes de Tablas Blanc: 59% Viognier, 32% Marsanne, 6% Grenache Blanc, 3% Roussanne. Light yellow color, citrus with floral hints in the nose, oily texture with mineral notes, and a crisp, clean finish. '06 Esprit de Beaucastel Blanc: 65% Roussanne, 30% Grenache Blanc, 5% Picpoul Blanc. Medium-light yellow color, stone fruit and spice, richer mouthfeel with a bit more oak evident, lots of acidity, lingering finish. '03 Esprit de Beaucastel Blanc: 68% Roussanne, 27% Grenache Blanc, 5% Viognier. Medium-dark yellow color, lots of spice and honey aromas, with some nutty character and a hint of citrus, very rich and smooth, long finish. '06 Vermentino: 100% Vermentino, very light color, subtle apple/pear fruit with a bit of citrus, medium weight in the mouth, bright acidity. '07 Rosé: 57% Mourvèdre, 31% Grenache, 12% Counoise. Light pink/magenta color, bright fresh strawberry aromas, some spice, and a very crisp finish. '05 Côtes de Tablas Rouge: 43% Grenache, 24% Mourvèdre, 18% Syrah, 15% Counoise. Medium purple color, cherry and raspberry aromas, hints of spice and earth, lively acidity, medium tannins. '05 Syrah: 90% Syrah, 10% Grenache. Medium color, blackberry aromas with herb, black pepper, and earth notes, big structure with firm tannins. '04 Esprit de Beaucastel Rouge: 50% Mourvèdre, 27% Syrah, 17% Grenache, 6% Counoise. Medium-dark color, plum, leather, and earth in the nose, picking up some spice in the flavors, good structure with medium-full tannins. '05 Esprit de Beaucastel Rouge: 44% Mourvèdre, 26% Grenache, 25% Syrah, 5% Counoise. Medium-dark color, bright boysenberry and plum aromas with strong earth, leather, and spice notes, great acidity, not quite as tannic as the '04. '05 Mourvèdre: 90% Mourvèdre, 10% Syrah. Medium-dark color, very earthy plum and blueberry with some savory notes, mouthfilling texture, firm tannins. '05 Tannat: 86% Tannat, 14% Cabernet Sauvignon. very dark color, bright grapey and slightly floral aromas with a touch of vanilla/oak, huge, rich wine with very grippy tannins. '05 Vin de Paille "Sacrérouge": 100% Mourvèdre, 142 g/L residual sugar. Medium-dark color, dark berry and chocolate in the nose, medium-sweet flavors echo the aromas, mouth-coating richness, very long smooth finish. It's always tough to say goodbye to friends after HdR is over, so a few of us gathered on Sunday morning to drive out to Tablas Creek. Traveling in a caravan along Adelaida Road from Paso Robles to the winery, we arrived shortly after their 10am opening time. 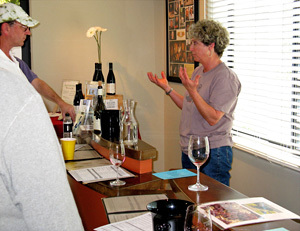 We were met there by tasting room assistant manager Sylvia Montague, who led us on a tour of the vineyard. The well-known partnership between Château de Beaucastel's Perrin family and Vineyard Brands importers' Robert Haas, Tablas Creek set itself apart from other Paso Robles wineries right from the start by obtaining its own cuttings directly from Château de Beaucastel. 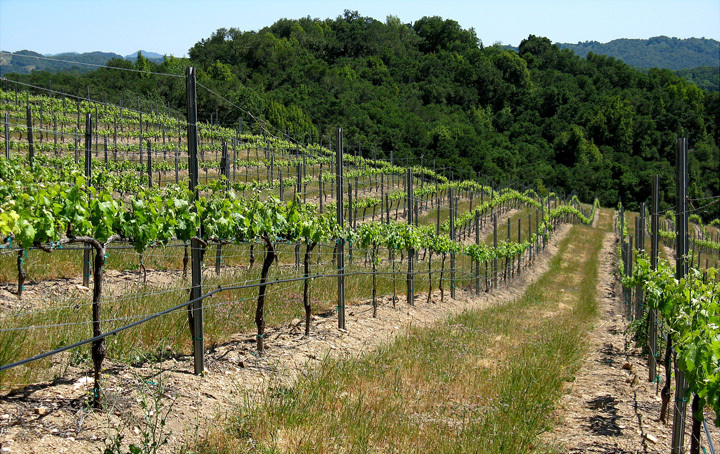 The winery imported its first vines in 1990, and planting the Tablas Creek vineyard began a few years later, following the certification process (to ensure the vines were virus-free). The vineyard used to have its own nursery facility, but that's no longer in operation and now Tablas Creek budwood is sold through NovaVine. The organic-certified vineyard is on a 120-acre parcel, with nearly 100 acres currently planted, one of newest plantings being on the Scruffy Hill section of the vineyard. There's a permanent vineyard crew of about 10 people, which allows the crew members to track each vine throughout the year. While the preference is to dry-farm the vineyard, there are some years when there's not enough winter and spring rainfall to achieve this, and the vines require a deep watering in the spring in order to get through the dry summer and fall. Walking back toward the winery, we stopped to look at the "mother vines", in pots adjacent to some greenhouses. We noticed one labeled Pinot Noir – Pinot at Tablas Creek?? Sylvia told us that they're propagating this for another property. 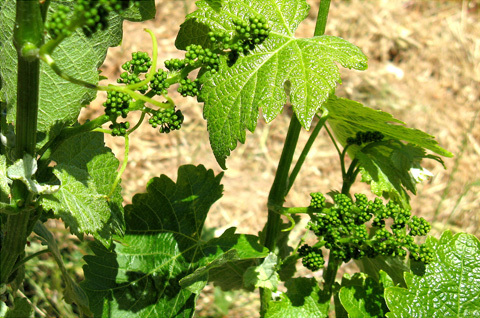 Tablas Creek currently grows 6 of the 13 permitted Châteauneuf-du-Pape grape varieties: Syrah, Grenache (both Blanc and Noir), Mourvèdre, Counoise, Roussanne, and Picpoul. They plan to add the rest of the varieties over the next few years: Cinsault, Muscardin, Terret Noir, Vaccarèse, Bourboulenc, Clairette, and Picardan. The winery has already imported the vines for these varieties, and the vines are now in quarantine undergoing the certification process. We took a quick walk through the winery and, of course, we had to gawk at the huge 1,200-gallon oak foudres. The winery's current annual production is about 18,000 cases, with a maximum goal of 25,000 cases. White wines are whole-cluster pressed using a bladder press, while the Rosé utilizes both saignée and whole-cluster press. 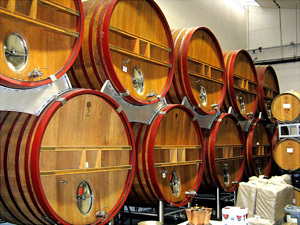 Reds are destemmed and tank-fermented, with pumpovers, before aging in the foudres. Walking back to the tasting room, Sylvia told us that Tablas Creek will be opening a new, larger tasting room in the future. The current spaces (even though expanded from the original small tasting bar) are often too small on weekends – and sure enough, the place had gotten pretty crowded by the time we left around mid-day. Plans for the new tasting room are still in the works. We all lined up at one of the tasting bars as Sylvia poured us many of Tablas Creek's current releases, plus one white with a few years of age. I'd tasted some of these bottlings back in December but some were new to me. But it's always interesting to compare notes on the same wines even a few months later. Tasting the Syrah, I recalled an earlier Syrah that Tablas Creek had produced from Glenrose Vineyard – an exercise in comparing fruit from another vineyard to their own, making the wine as they would from their own vineyard. I asked Sylvia about that wine, and she told me it was a one-time experiment, and she doesn't expect the winery to do it again. Tablas Creeks' elegant wines stand apart from most of the bigger, fruitier renditions of Paso Robles Rhône-style wines and it's always an enjoyable experience to taste there. '07 Sauvignon Blanc, Cedar Lane Vineyard, Arroyo Seco: light color, gooseberry and citrus aromas, with grapefruit notes on the crisp finish. '07 Viognier, Cedar Lane Vineyard, Arroyo Seco: light color, citrus, peach and floral notes on the nose, a hint of oak in the rich mouthfeel, a little bottle age should smooth out some slight roughness in the finish. '07 "XOXO" Rosé, Central Coast: Tempranillo/Syrah/Grenache. Pretty light pink color, strawberry and cranberry aromas, juicy acidity and smooth finish, very refreshing. '06 Pinot Noir, Cedar Lane Vineyard, Arroyo Seco: medium-light color, red fruits, tea leaf, and a hint of spice, a leaner style of Pinot for California, lingering finish. '05 Syrah, Paso Robles: medium-dark color, blackberry, earth, and herbs in the aromas, a touch of pepper, with rich mouthfeel and mild tannins. Everyone from our group said our goodbyes before leaving Tablas Creek, so a couple of people who'd left just ahead of me, Bob and Boyce, were surprised when I pulled up next to them outside of Hug Cellars shortly afterwards – great minds do think alike! We'd hoped to catch Augie & Raquel but it turned out they had decided to take a break following the busy HdR events. Sonia Vega was behind the tasting bar, and she poured us five of Hug's current releases. These are all very nice wines, as I've come to expect from Hug. In particular, the new Sauvignon Blanc was excellent. Made in stainless steel with no malolactic fermentation, it's very successful in emulating the New Zealand style without going overboard on the "cat pee" character. Also, the Paso Robles Syrah is a fine Central Coast Syrah for the price, a hedonistic wine with some real Rhône character. There's something about Hospice du Rhône week that is special. Sure, the almost-nonstop wine and food has something to do with it, but mostly it's about seeing old friends again (many of whom I only see once a year at HdR) and making new friends. Along the way there are some unforgettable experiences and usually at least a few spectacular wines. This year was no exception – highlights included a wonderful dinner held at Hug Cellars and catered by our old friends Chef Claude Chazalon and his wife Chrystel, formerly of Paso's Paris Restaurant, and bottles of '94 Vieux Telegraph and '82 Jaboulet La Chapelle. I'm already looking forward to next year's HdR week. As always, thanks to everyone that we visited for being so generous with their time and their wine!